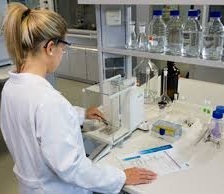 Determination of the operating range of the balances used for pharmaceuticals including the analytical balances. Balances are used to weigh different things as raw material, dispensed material and samples. Sometimes very low quantity is weighed for analysis. An error in the weighed material can cause a big variation in analytical results. Balance for analytical use must be closed; an open balance may cause inaccurate weighing. Hygroscopic material gains weight when it comes in contact with the air causing unstable weighing. Airflow or current in the balance room may cause a disturbance in accurate weighing. Unleveled surface or balance may lead to inaccurate weighing. A vibrating surface can also cause inaccurate weighing. Assay, related substances and other quantitative analytical tests require accurate weighing for better results. Near the lower and upper capacity of the balance, weighing may be inaccurate. Therefore, a weighing range must be defined for all balances. Some manufacturers direct in their operating manual to weigh minimum 1.0 mg on balance having 0.01 mg least count i.e. least count X 100. But the thumb rule followed in pharmaceutical industries for lower limit is least count X 50 and the upper limit is 80% of the capacity of the balance. If any balance has the operating range from 0.01 mg to 110 gm then it should be used for weighing the material from 0.01X50 = 0.50 mg to 110X80% = 88.00 gm. Detailed guidance on the balances can be learned through OIMLR76-1 Non-automatic Weighing Instruments. But according to USP <41> Weights and Balances, a simple theoretical calculation can be used to calculate the minimum weight for any balance. To weigh 10 mg sample you have to use 10X0.1% = 0.01 mg least count balance. It shows that if you have a balance with least count 0.01 mg, you can weigh minimum 10 mg sample on it. Other weights can be calculated accordingly. Update: Simply you can calculate the minimum limit by multiplying least count by 1000.
thank you so much it is help full. Can you please explain, which guideline is saying to fix the 80% weight as higher capacity of the actual capacity of the weighing balances. Sir, Is that necessary to perform daily verification after monthly calibration of analytical balance???????? Sir... Is that necessary to perform daily verification after monthly calibration of analytical balance? ?